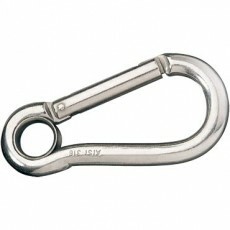 Stainless Steel Carabiner hooks (Carbine or Karabiner) are a fast means of attachment. Made of AISI 316 grade with a sprung closing mechanism. The carbine hook enables items to be quickly connected. Perfect for access work in commercial and industrial environments. Simple single handed operation. 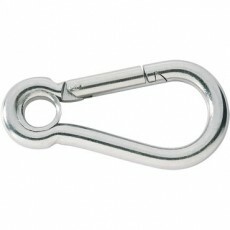 These hooks are not intended for human suspension and are ideal for fast attachment of tool lanyards etc. Not all models are load rated, each includes a removable thimble to prevent tangling or accidental removal of the hook from the lanyard. Grade 316 AISI Stainless Steel is a high grade allowing for use in extremely corrosive environments. All parts of these hooks are made with this grade stainless steel including the spring system meaning the hooks will perform flawlessly for years under the harshest of conditions. Additional sizes and rating may be available on request.